John Lennon/Yoko Ono - Wedding Album. Vinyl LP. Bleep. John Lennon and Yoko Ono have their LP Wedding Album reissued in the week of what would have been their 50th anniversary. The third of three full-lengths the pair made together at the end of the 60’s - the others being Two Virgins and Life With The Lions - this record saw the pair using their craft as vehicle for messages of peace, love and unity. 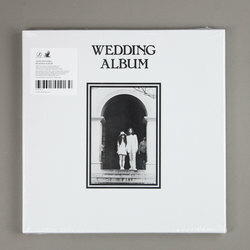 Secretly Canadian have taken great care with this new edition of Wedding Album. They’ve included photographs, drawings and a copy of the pair’s wedding certificate with the vinyl pressing, and even had the packaging made by the same vendor who did the boxes back in 1969.